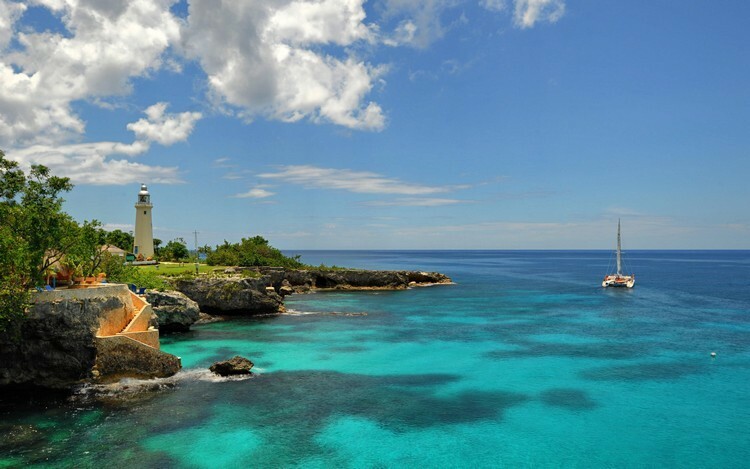 Jamaica which is the third largest island in the Caribbean is a wonderful luxuriant tropical paradise. As well as having great beaches, a vibrant culture, incredible scenery, lively music and wonderful food, Jamaica is without a doubt the friendliest of all the Caribbean islands. Jamaica is crossed by a range of mountain in the centre of the island reaching 2256m in height at the Blue Mountain peak. The Blue Mountains span some twenty eight miles and they dominate the eastern side of Jamaica and it is here that the famous Blue Mountain Coffee beans are grown. There is great scenery and walking in the Blue Mountain however most visitors to Jamaica come for the wonderful weather and the beaches. There are many other activities to be enjoyed such as a walk up the incredible waterfall at Dune’s River, historical tours of some wonderful old plantations houses and walking around Shaw’s Botanical Gardens. Then there is the wonderful Jamaican food to be enjoyed which is a fusion of different cultures and so often can be enjoyed to the sounds of distinctive and eclectic music which is a great tradition in Jamaica started by the King of Reggae Bob Marley. You can make 10 trips to Jamaica and visit 10 different places and each time you will return home with a kaleidoscope of different memories; the beaches, the sea, the reefs, the dolphins, the cliffs, the rivers, the horses, the mountain and the waterfalls. Oh and not to forget the Rum! Most of our luxury vacation rentals in Jamaica are located to the north and west coast which is also where the most fabulous beaches are located. Here you will find exquisitely blue waters and some of the best diving in the world as well as some great golf courses. The main areas are Montego Bay, Negril where you will find a 7 mile long beach with pearl white sands and clear shallow waters and Ocho Rios but we do also have some wonderful villas rentals close to the capital Kingston in Strawberry Hill and other more remote parts of the island. Jamaica enjoys a hot, tropical climate tempered by cooling trade winds, with temperatures remaining high year-round. Rain showers are few and far between and non-stop sunshine is the order of most days. When rain does occur it tends to be a short downpour. However, tropical storms and hurricanes can occur between July and November. These figures show Jamaica’s monthly average maximum temperatures and monthly average rainfall. With average temperatures of 80°F, with peaks at 95°F and rarely less than 68°F, the island is the perfect sun-filled destination, especially during the cold winter months in the US or Europe. Temperatures in the mountains can be more temperate. These figures show Jamaica monthly average maximum temperatures and monthly average rainfall.